Emeralds are without doubt one of the most unique gemstones. Each one of these treasures is a captivating work of art. Of all the gemstones to collect and revere, there is something truly captivating in each and every Emerald. Emeralds have such a unique fingerprint; each one feels like it has its own personality. There is truly an Emerald for everyone. Emeralds are one of only a small handful of gemstones which are known as ‘Type 3’ gems. That means that due to the immense pressure and stress under which they were created, deep down within the earth, they are not very likely to look ‘transparent’. However, it is these inclusions (known as an Emerald’s jardin) that make each gemstone a uniquely perfect natural work of art. More important than clarity is glow– this is how well you can see into the heart of the stone. A cloudy gemstone is less desirable than one with great transparency but a few inclusions. Emeralds are prized for their extraordinary colour and vibrancy. 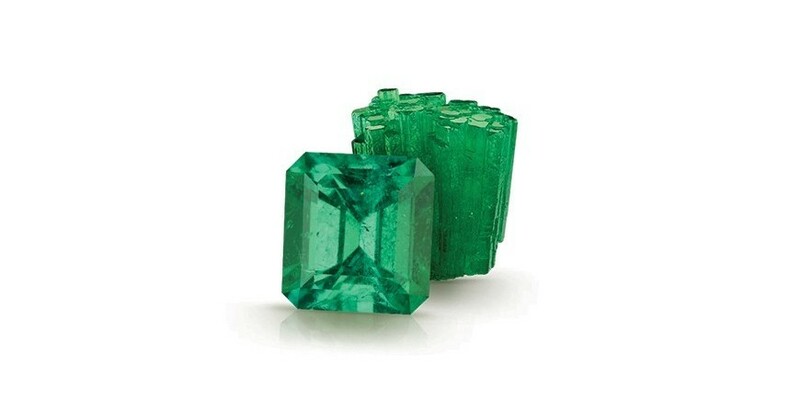 Some Emeralds are a pure green – and this is preferred by some collectors. Most Emeralds however, will show a secondary colour of yellow or blue. Many people have a preference, but pick whichever appeals to you. Most Emeralds will have been treated in some way, whether its filling, or simply a case of applying baby oil to maximise brilliance. If you don’t know if an Emerald is completely natural or not, assume that it will have had some treatment. Here at Nine Gems, we always disclose what treatments have been used on our gems. Some collectors rate Emeralds on where they come from. The majority of Emeralds being unearthed at the moment come from either Brazil, Colombia, or Zambia. However, you should always judge an Emerald on its own terms rather than where it is from. Even if some locations carry more prestige than others, it is better to have a fantastic Emerald from a less well regarded location, than a cloudy gem with poor colour from the most famous mine in the world. Our advice is always to pick whichever Emerald you prefer. Just like matchmaking, there is the right Emerald for everyone, it’s just a case of finding it. There is no hard and fast rule to choosing an Emerald – try a few different cuts, sizes, and colours, and find the one that speaks to you. Don’t worry what anyone else thinks. Ask yourself the question ‘Do I love it?’ and if the answer is yes, then it’s the right Emerald for you.